Dr Abhijit Sen Gupta is currently an Economist with the Indian Resident Mission of the Asian Development Bank. He obtained his Ph.D. in International Economics from the University of California, Santa Cruz. He also holds M.Phil. and Masters degrees in economics from Jawaharlal Nehru University. His main areas of interest include open economy macroeconomics, public finance and monetary economics. He has published more than a dozen academic articles in both refereed international journals and conference volumes, together with a host of op-ed articles for the general public. 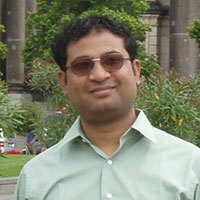 In the past, Dr Sen Gupta has worked with ICRIER, World Bank and International Monetary Fund. He has also worked on several Government of India commissioned projects including one that looked at the opportunities and costs of liberalising banking and insurance services under an India-EU trade agreement. Dr Sen Gupta has also enjoyed stints in academia. As a tenured Associate Professor, he taught macroeconomics and international finance at the Jawaharlal Nehru University, and supervised several M.Phil. and Ph.D. students. He also taught intermediate macroeconomics at the senior under graduate level at the University of California, Santa Cruz.